In the October issue of the Argosy an article was found which stated that Colonel Charles Wayne Kerwood attended Western Military Academy and then gave an interesting account of his experiences. 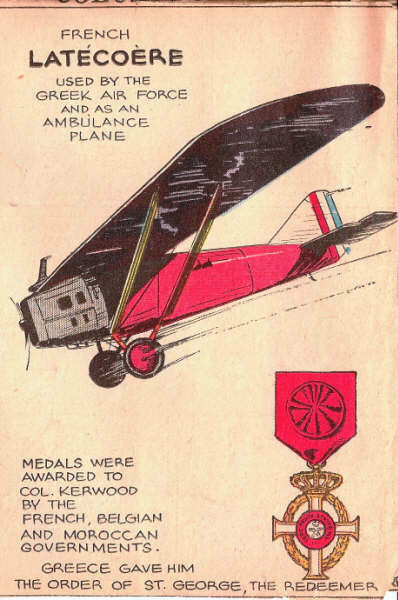 Colonel Kerwood was born at Evanson, Illinois, in the year 1896. He is a descendent of General "Mad Anthony" Wayne. Having graduated from Western Military Academy, he became a special student at New York University and the University of Grenoble, France. In 1916 he saw service in the French Foreign Legion and later transferred to the Lafayette Escadrille. In 1919 he demonstrated a new fire proof airplane fabric by soaking the plane in gasoline, setting fire to it, and then flying the mass, being encased in an asbestos suit. As commander of the Royal Greek Air Service, he fought in the war against Turkey in 1921. Then he represented the Greek government in various diplomatic capacities. 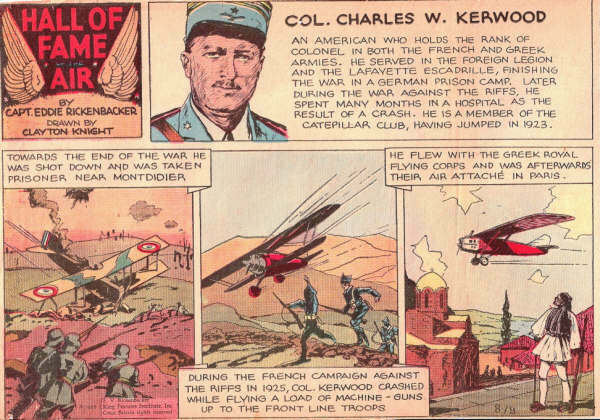 Five years later as a Colonel in the French Air Service against the Riffs in northern Africa, he distinguished himself in many daring long distance raids, dispersing besiegers by machine guns from the air and protecting columns of French troops. He later commanded the Cheriefton(?) (Sultan's) air force, continuing the war against the Riffs until order was established in the territory. In 1932 he returned to the United States to receive his commission as a Colonel, and was ordered on a special mission in the Near East which was completed in a highly satisfactory manner. He has been decorated by all the allied powers and by many other governments. TWO AMERICAN FLIERS AT THE FRONT MISSING; Charles Kerwood Last Reported in a Clumsy Bombing Machine Fighting Seven Germans. He was a soldier of fortune, aviator and member of the Lafayette Escadrille who rushed to Europe to get involved in WWI. This swashbuckler later flew for the French Foreign Legion in their war against the Riff's in Morocco. The Riff's rebel chief put a $5000 in gold bounty reward offer for Kerwood 'dead or alive'. He survives that war to return home where , in 1919 he helps the police commissioner of NYC organize a short lived 'metropolitan Air Force' the 1st aerial law enforcement agency in the world.